Important to know about the fabrics we use, if we will be washing it. Inhave somemlines she didnt test that I want to. Anyone else do any shrinkage tests like this? To pre-wash or not to pre-wash? That is totes the question today! Do you do it?? Personally, I so rarely pre-wash, especially if I’m making a quilt (shhh, don’t tell, sometimes even with a garment). Pre-washing adds in a lot of steps to a project and if I am feeling inspired to make something I want to do it NOW. I know some people always pre-wash, it’s like second nature to them. As soon as their fabric comes home it goes straight into the wash. This got me curious about how much I’m really risking in my act of defiance/laziness. 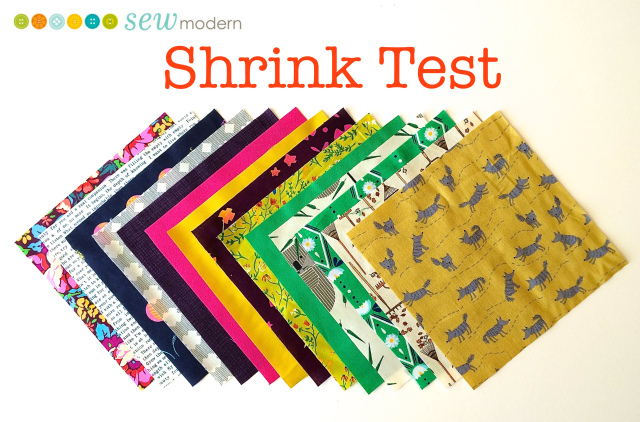 How much is my fabric really going to shrink? So I took a swatch from each of the fabric manufactures we carry at the shop and gave ’em a whirl in the washer. The results were kind of shocking and not all results were the same.